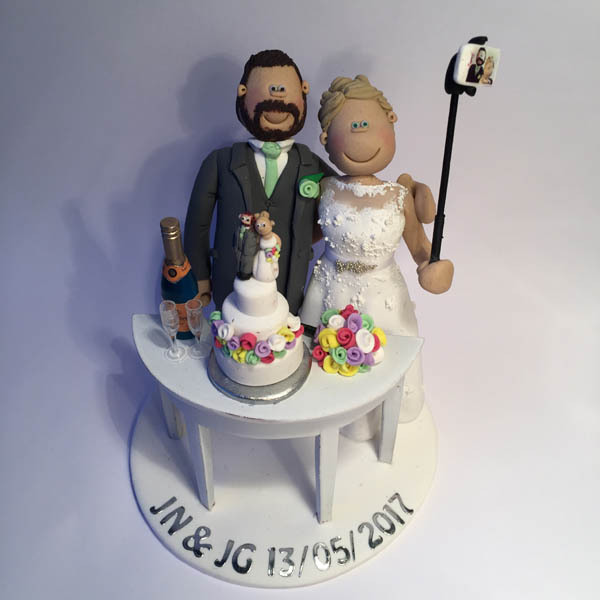 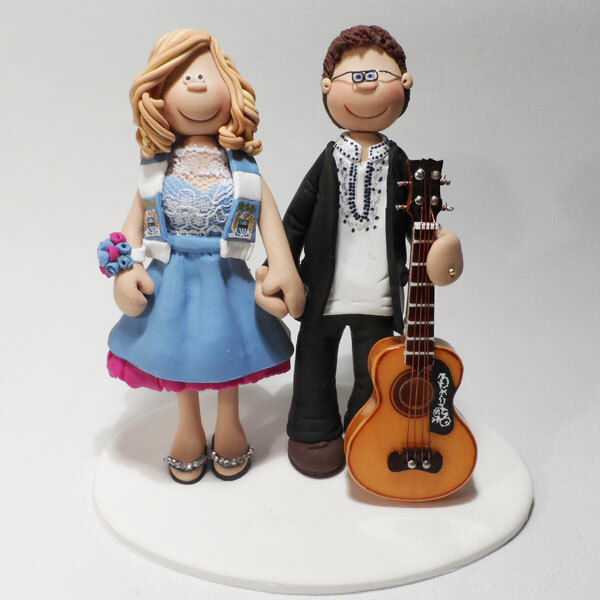 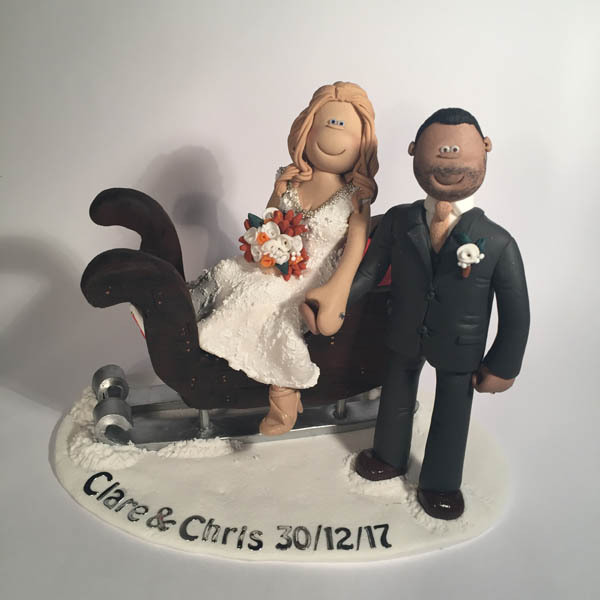 A wedding cake topper featuring a wedding cake topper and a selfie stick! This dog wanted to help his owner with the proposal! 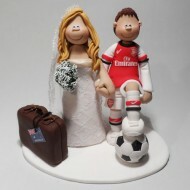 This groom was trying to escape to the football! 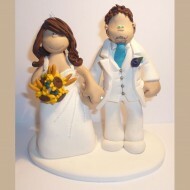 We love the groom’s sunflower button hole in this topper! 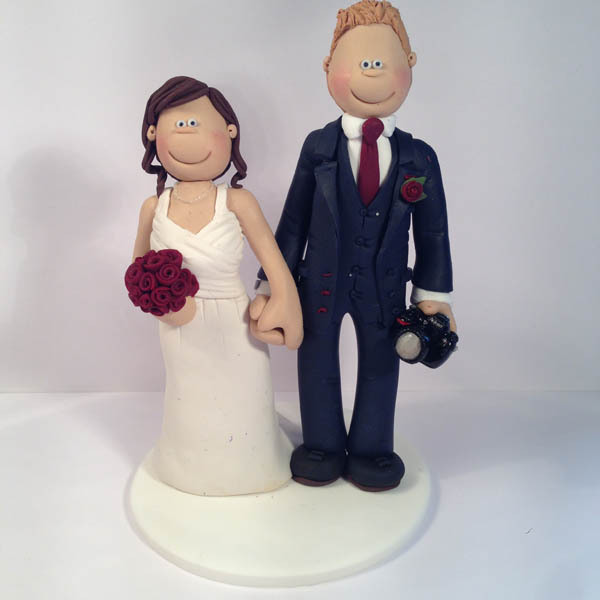 We absolutely loved this selfie, pouting cake topper! 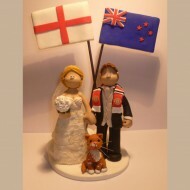 It’s not the flag that gives away this groom’s nationality! We’re not sure how to describe this pose? A reclined embrace? 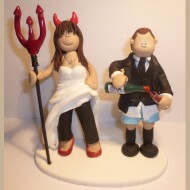 A classy couple with a ‘cheeky’ side to them! 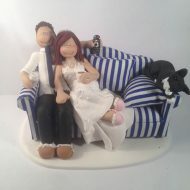 A lovely pose photobombed by one of the pet cats! 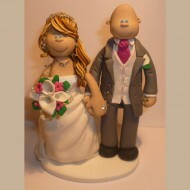 A bride and groom who have possibly over celebrated! 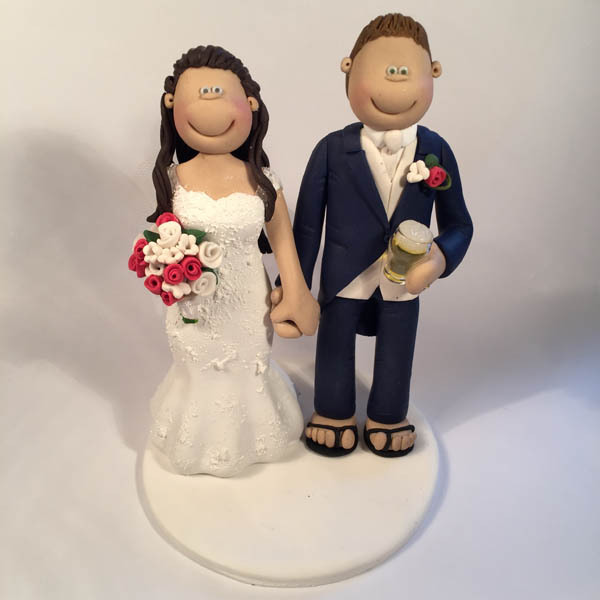 The groom enjoying a celebratory pint after the wedding! 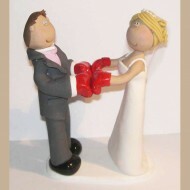 A lesson all men must learn, the woman is ALWAYS right! 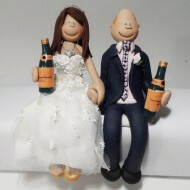 A couple enjoying a couple of bottles of champagne! 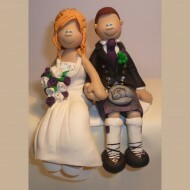 A naked couple with their modesty just about covered! 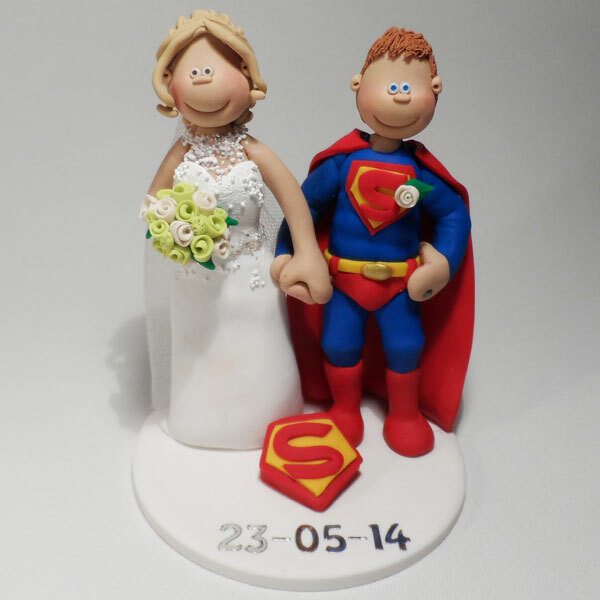 A bride with her superhero groom in his superman outfit! 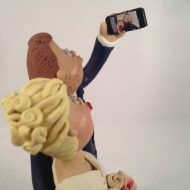 A bride and groom on their mobiles texting! 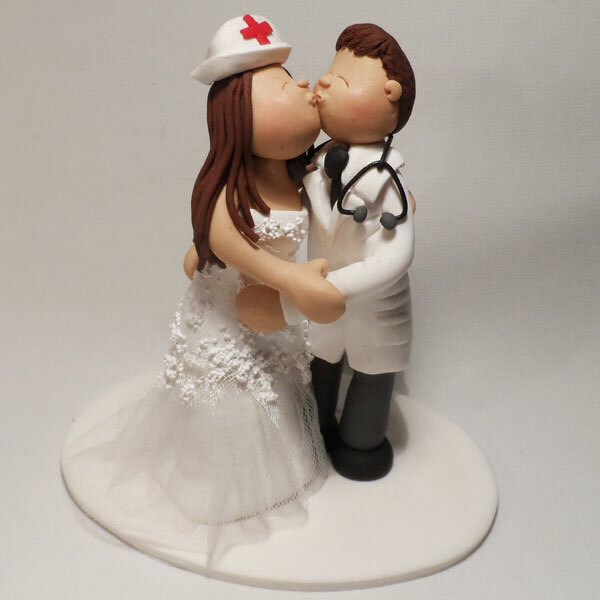 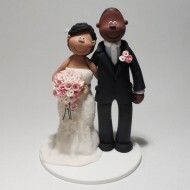 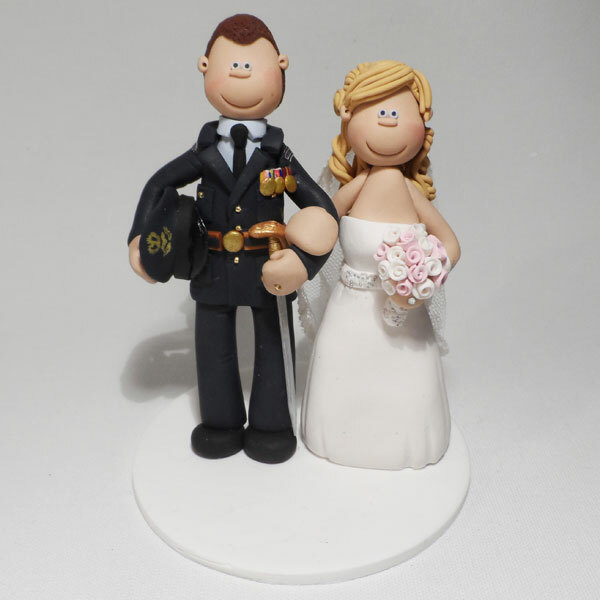 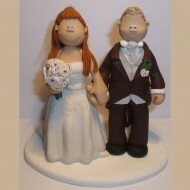 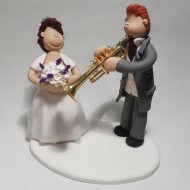 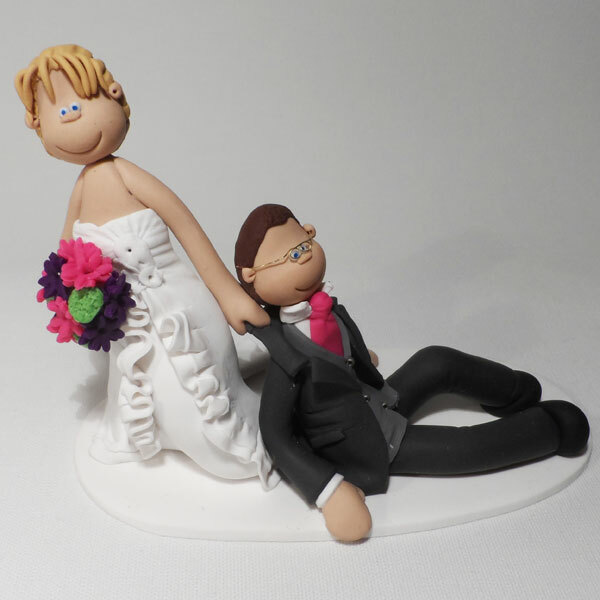 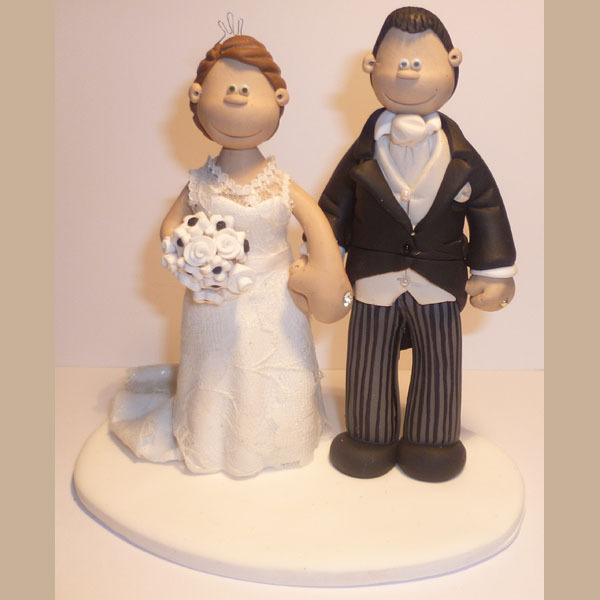 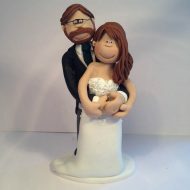 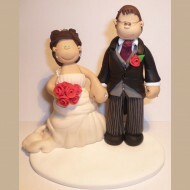 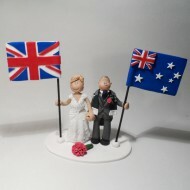 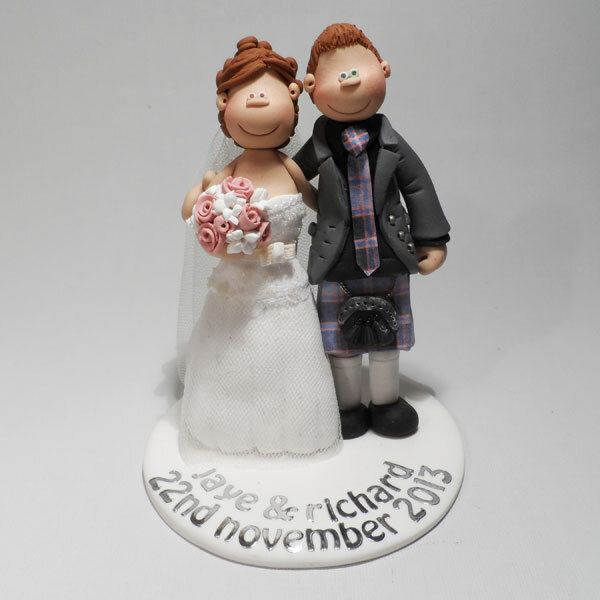 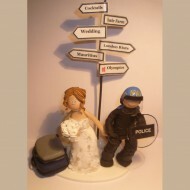 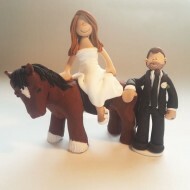 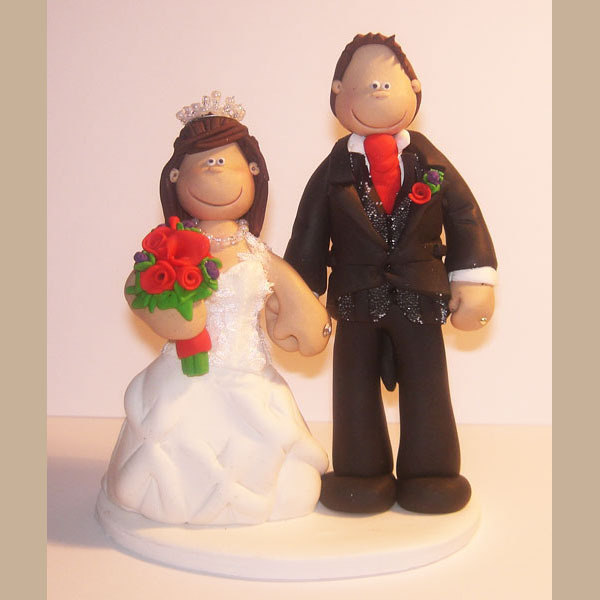 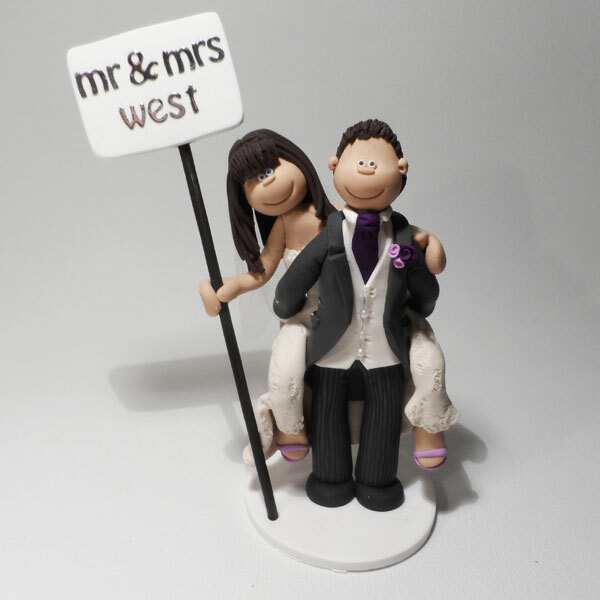 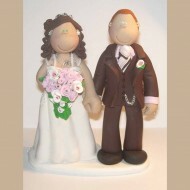 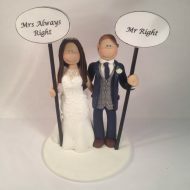 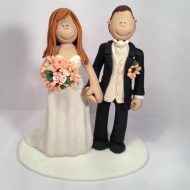 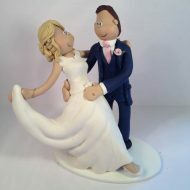 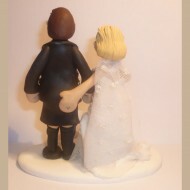 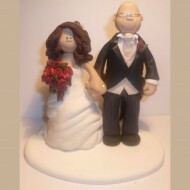 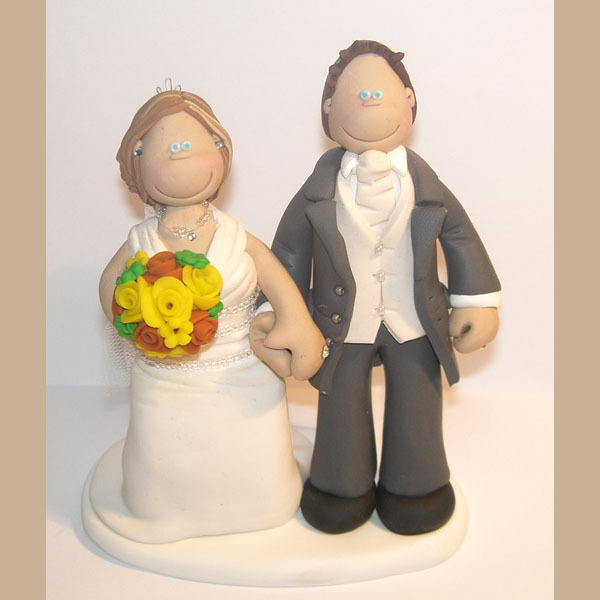 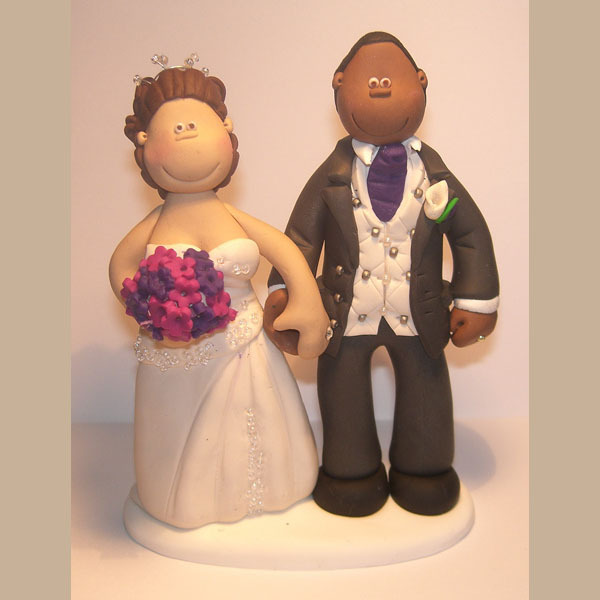 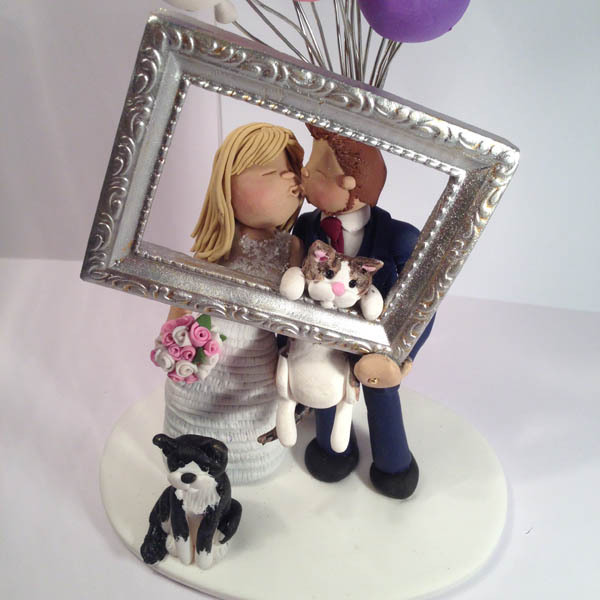 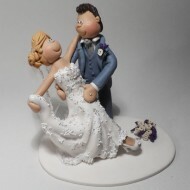 Another one of our popular piggyback cake toppers! A really cute couple in a ‘hands on bum’ pose! 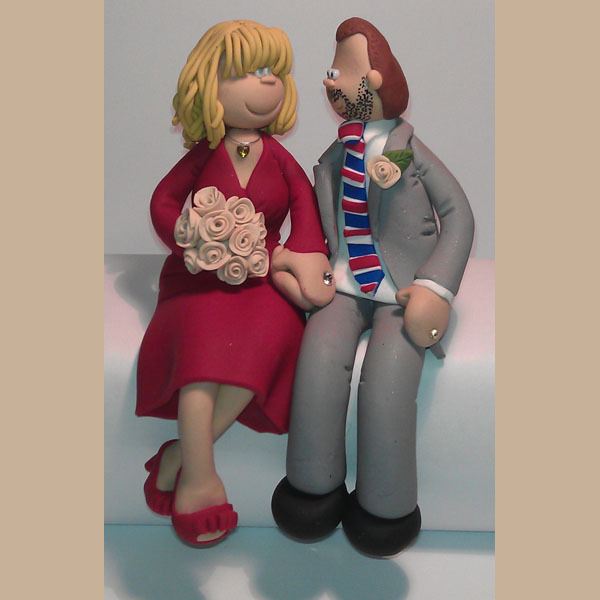 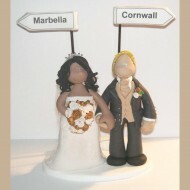 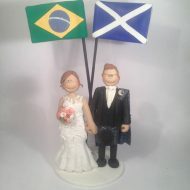 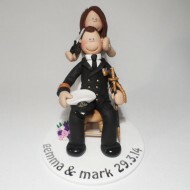 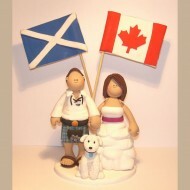 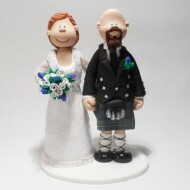 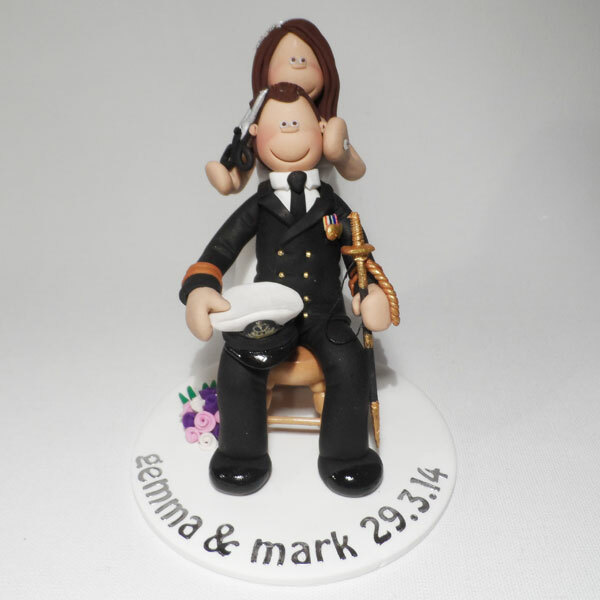 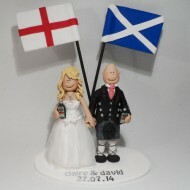 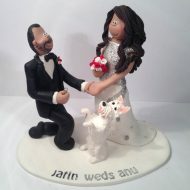 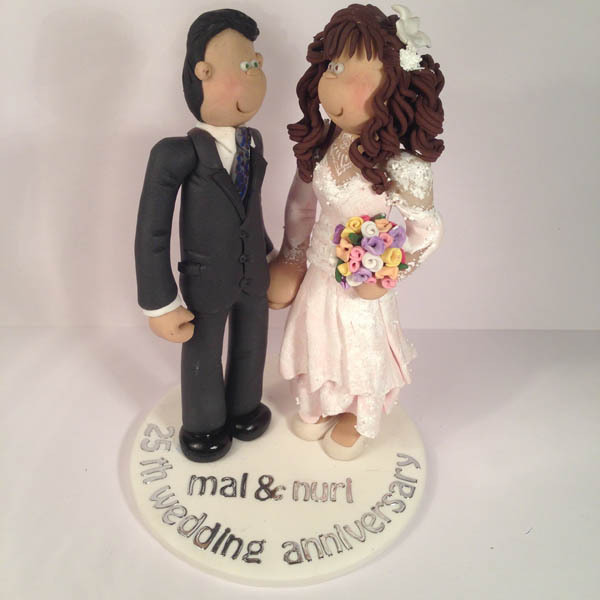 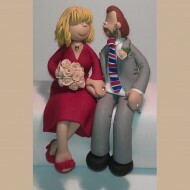 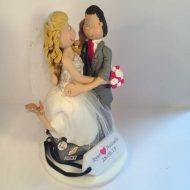 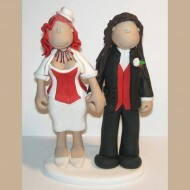 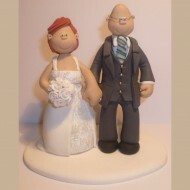 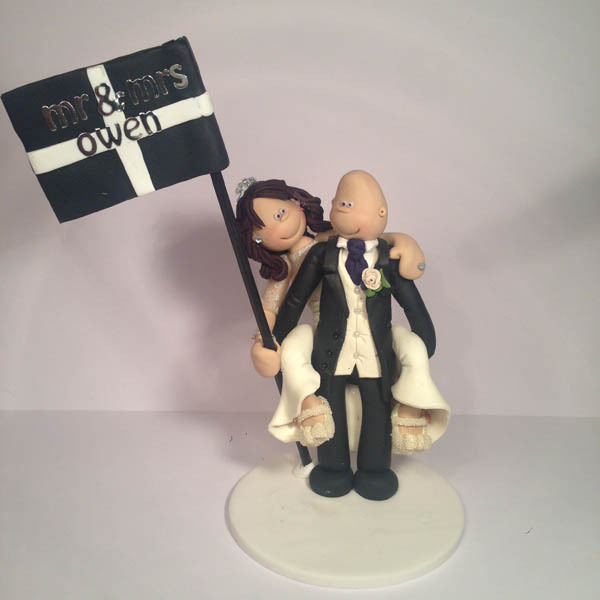 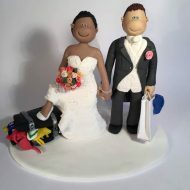 Our first ever hairdressing wedding cake topper! 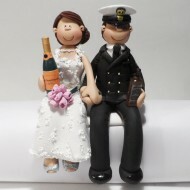 A bride and groom enjoying bottles of champagne and Jack Daniels! 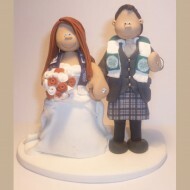 We love the bride’s dress and scarf combination in this topper! 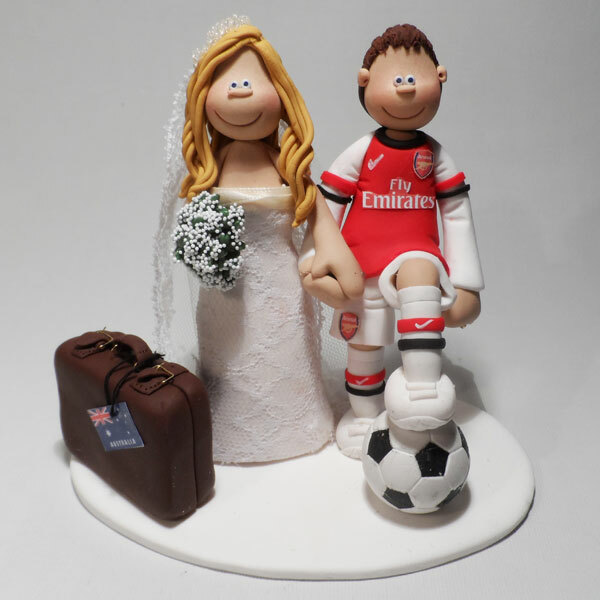 A trip to Australia with the groom in his Arsenal shirt! A cricket player with his bride who wanted to show off her shoes! We love the groom’s hat in this piggy back wedding cake topper! 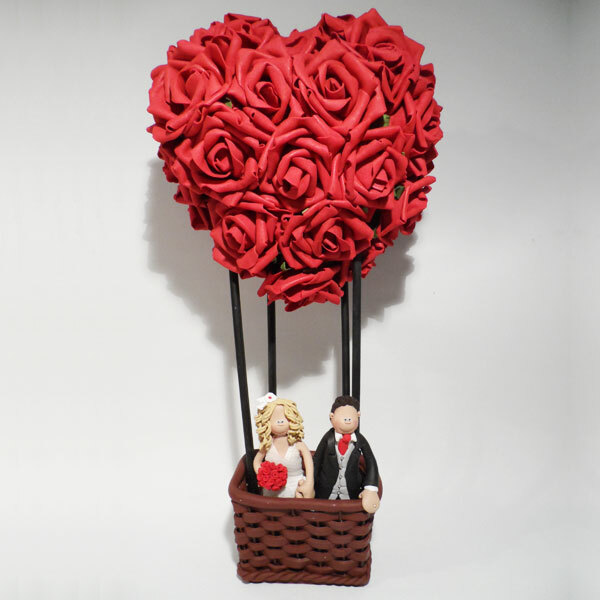 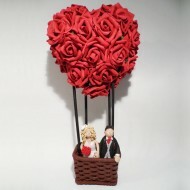 A topper in a heart shaped hot air balloon made from roses! 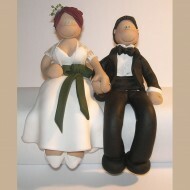 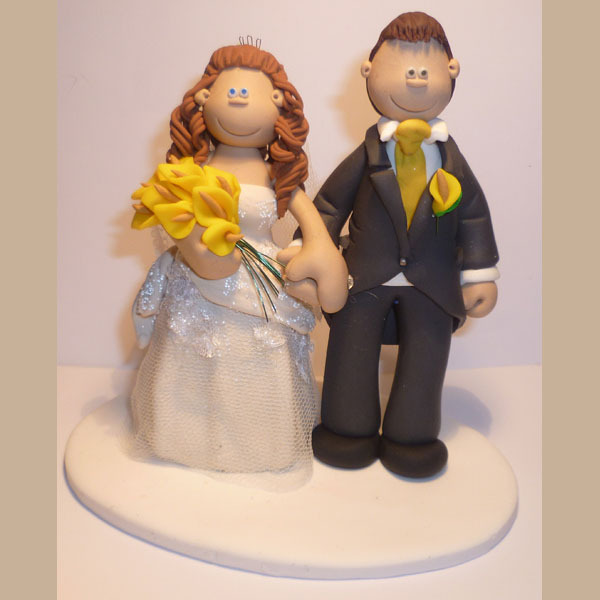 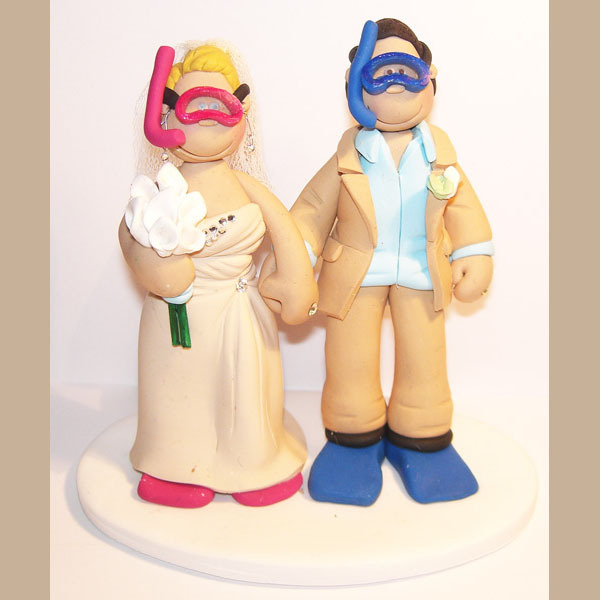 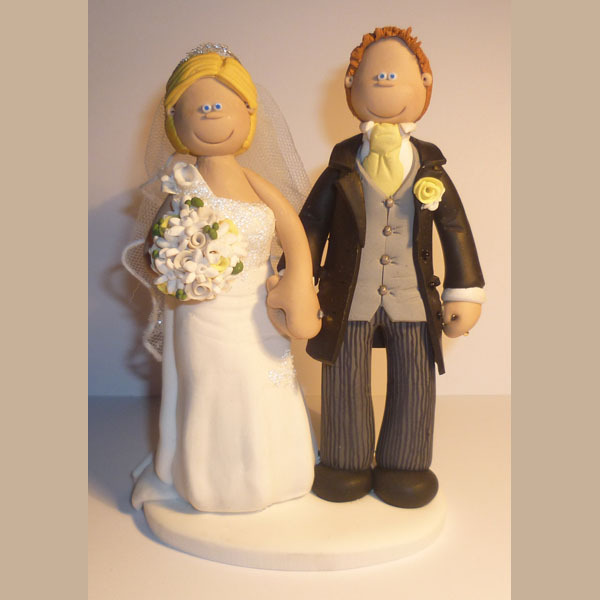 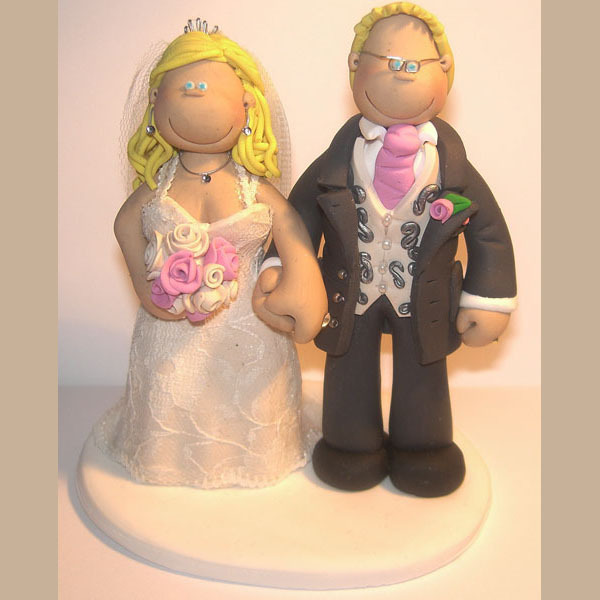 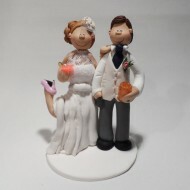 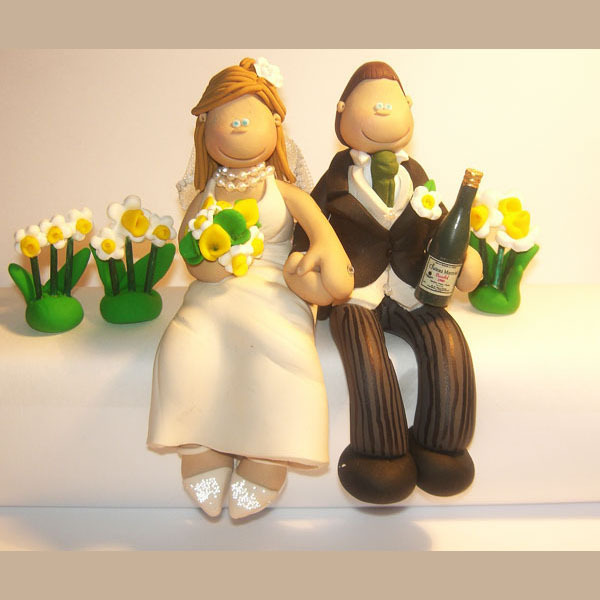 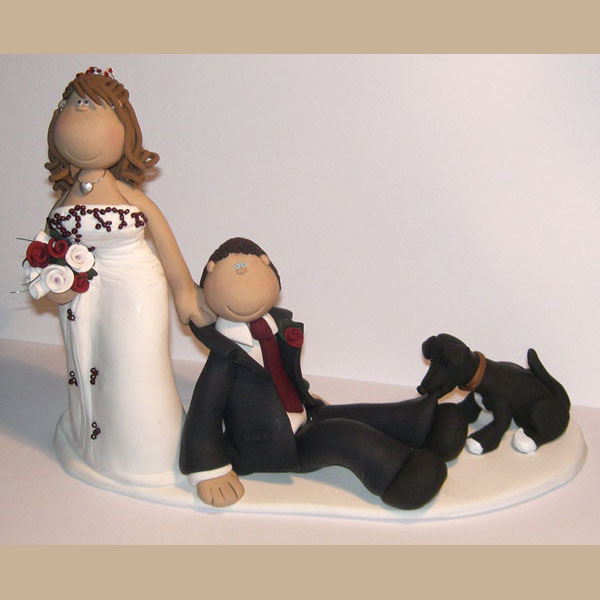 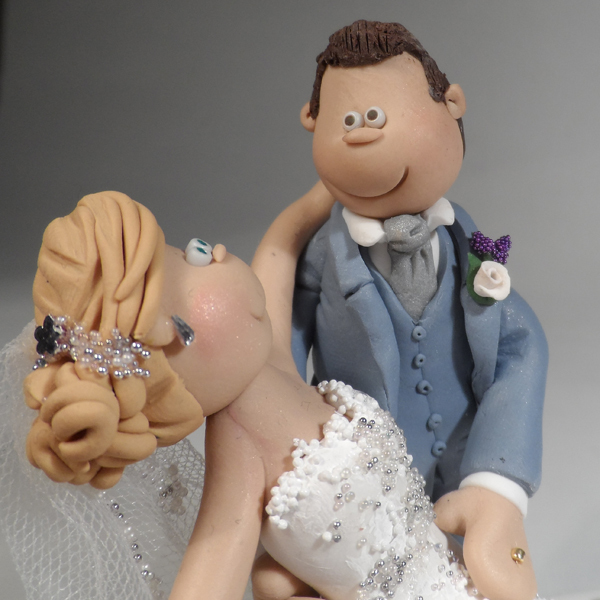 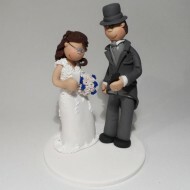 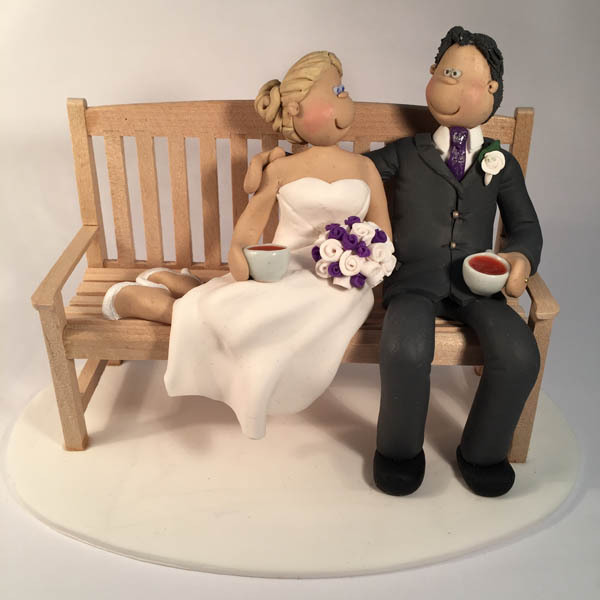 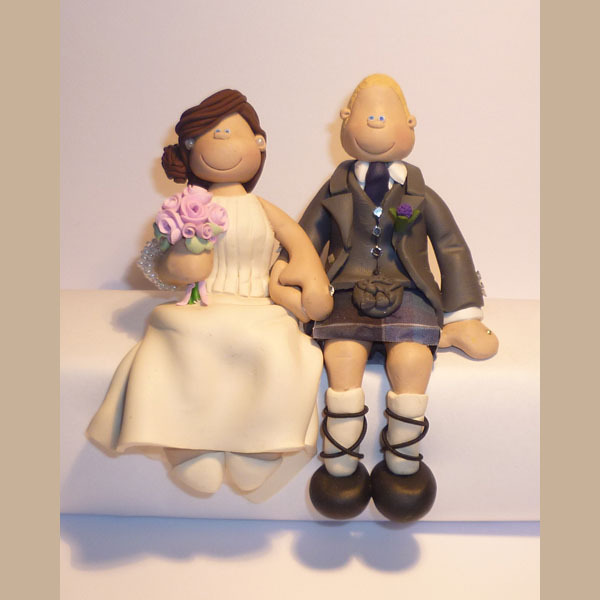 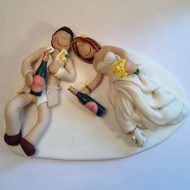 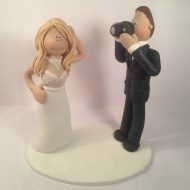 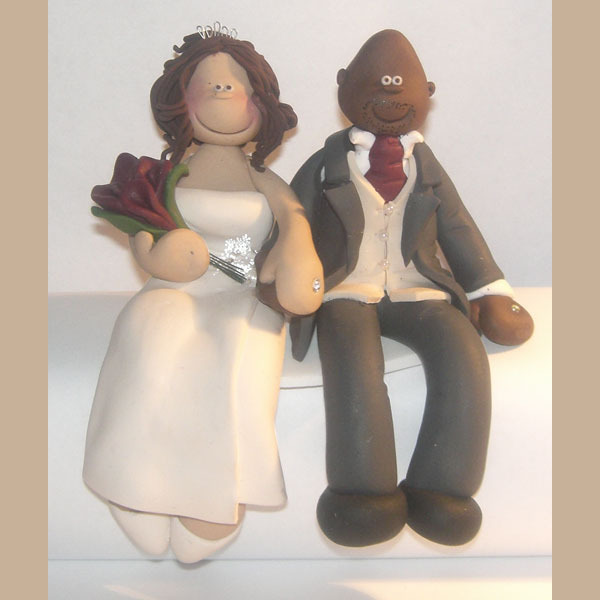 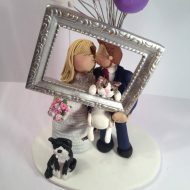 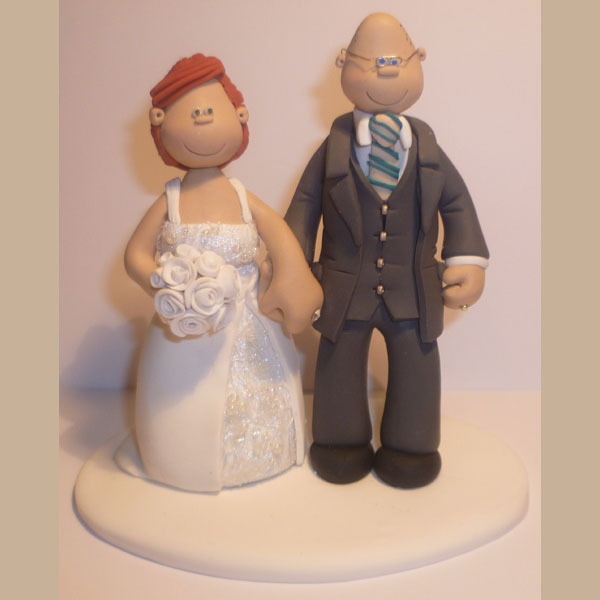 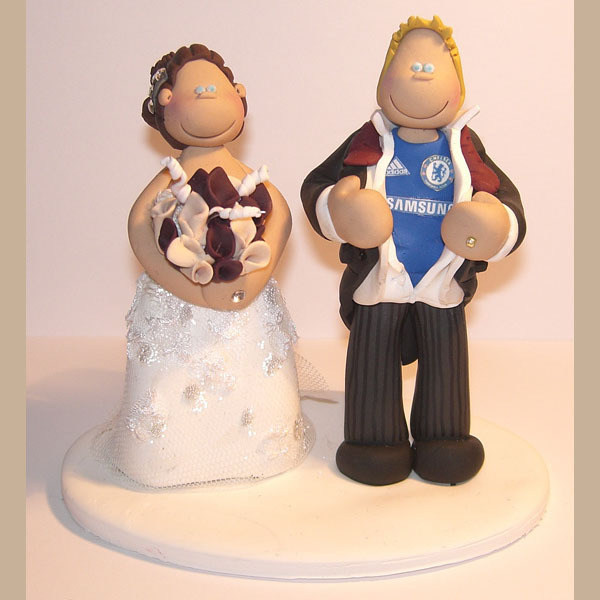 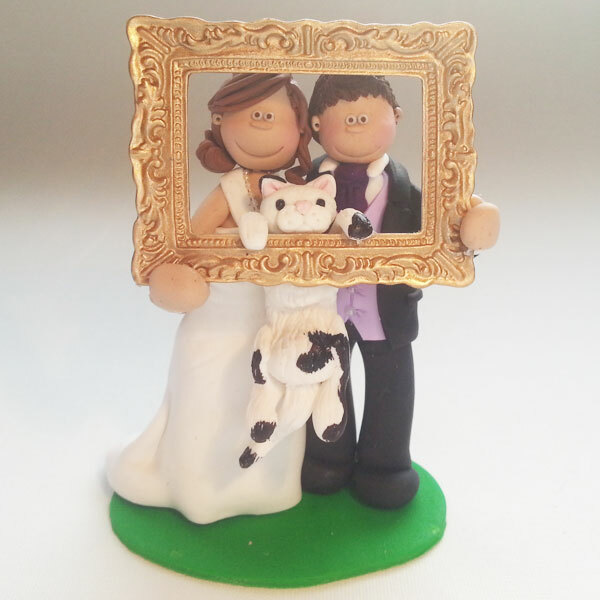 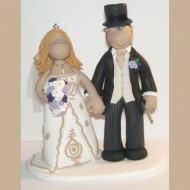 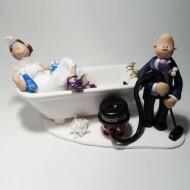 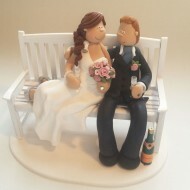 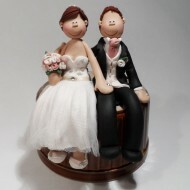 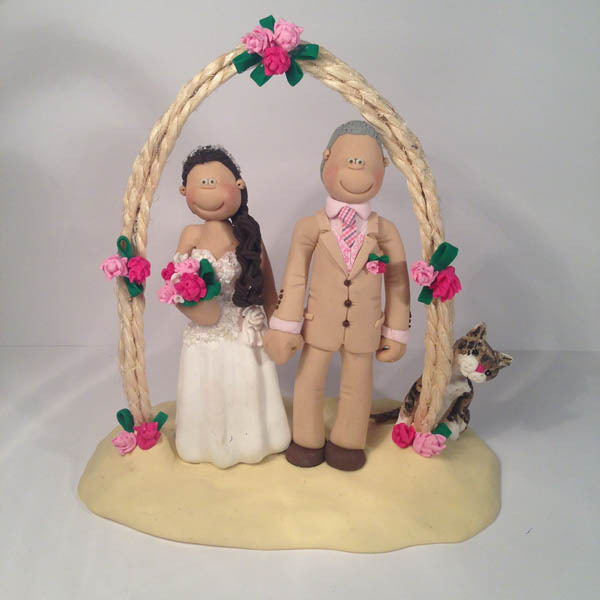 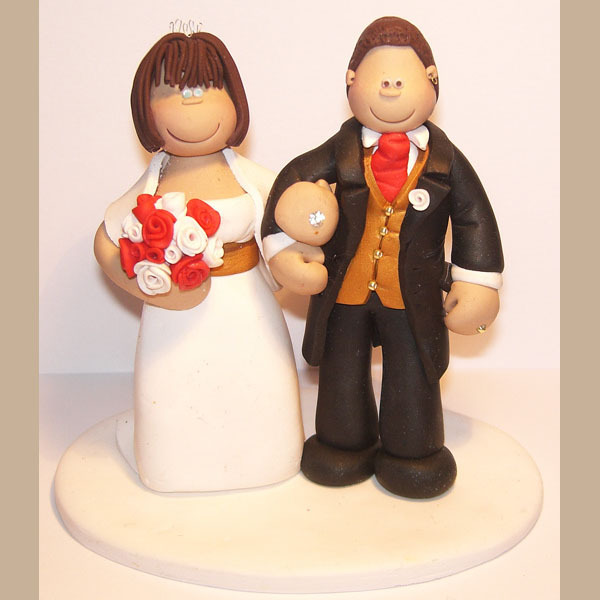 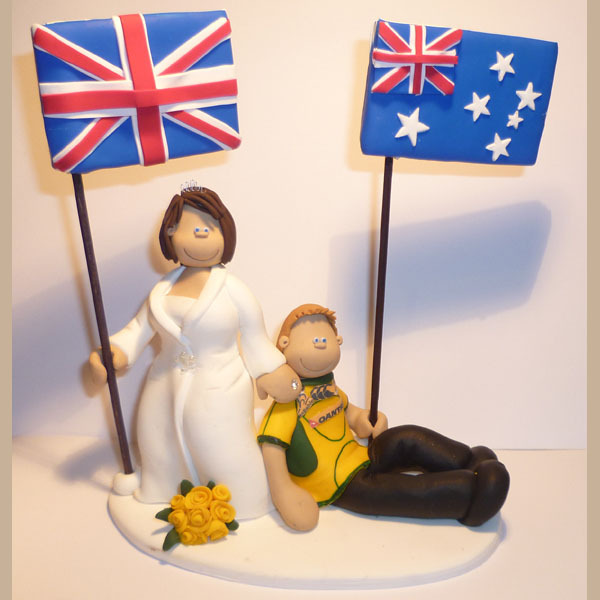 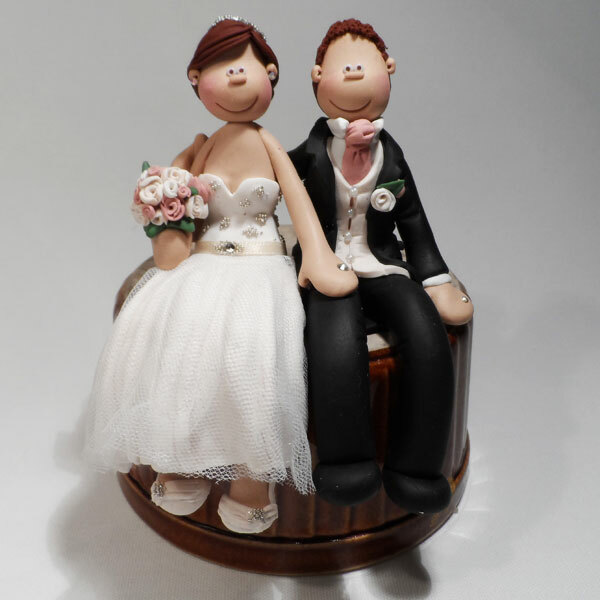 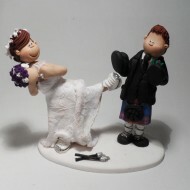 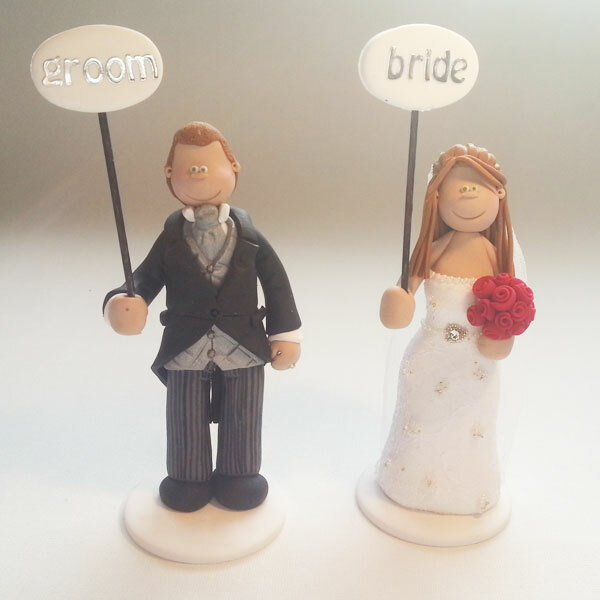 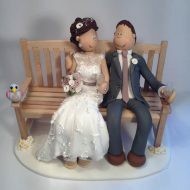 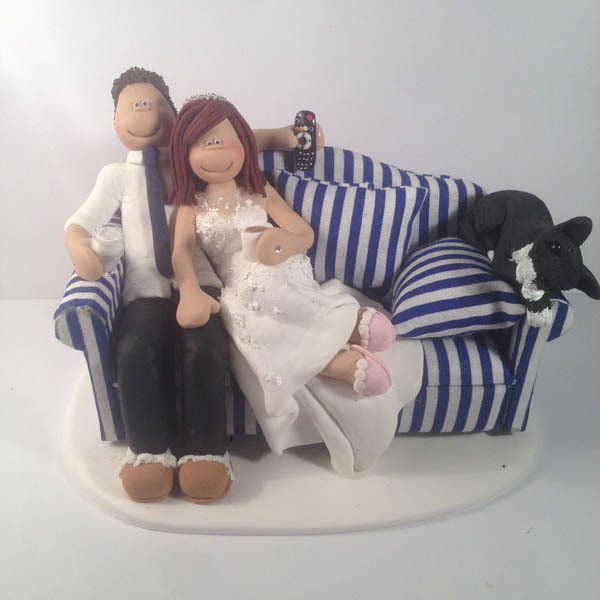 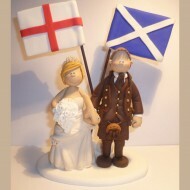 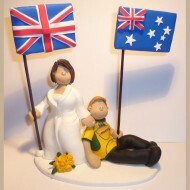 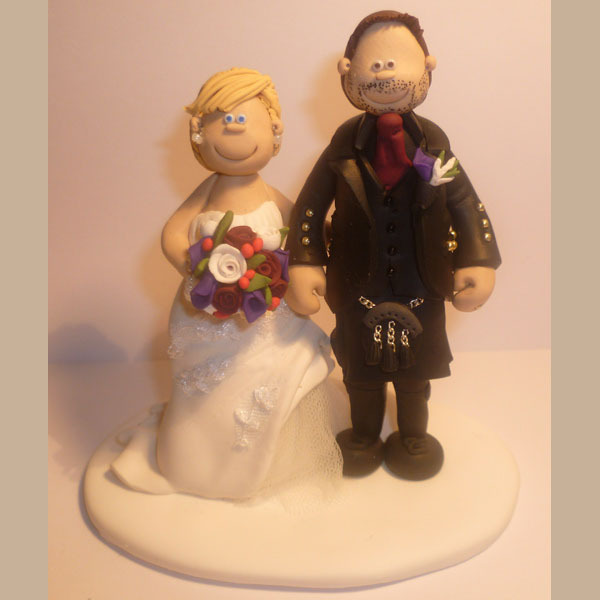 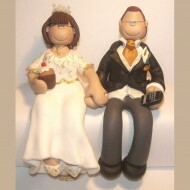 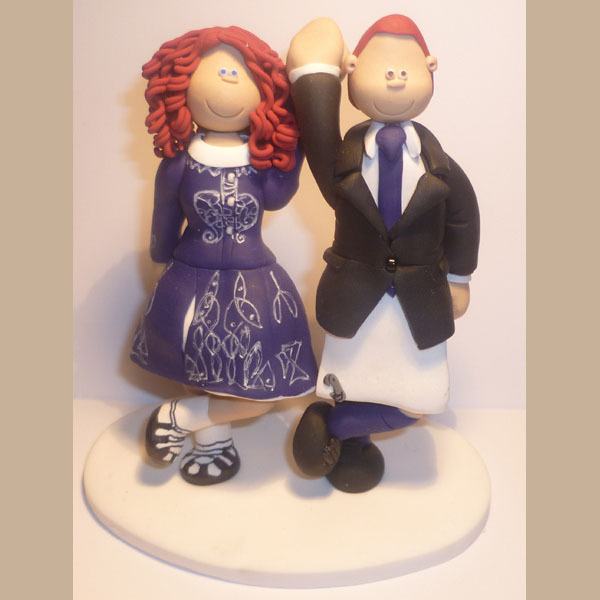 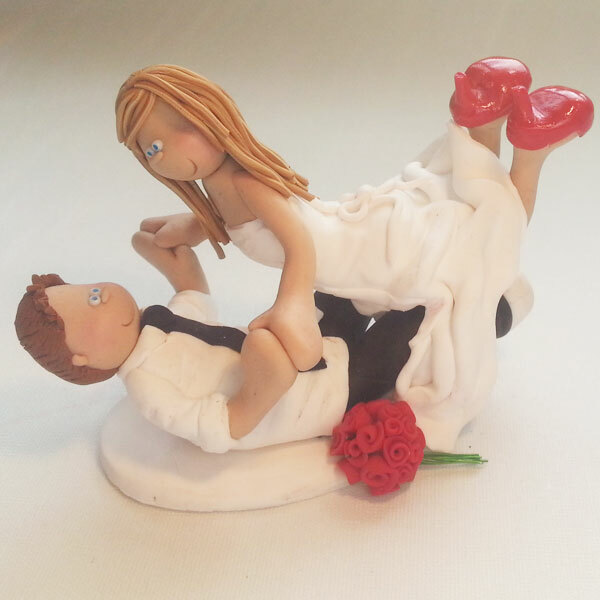 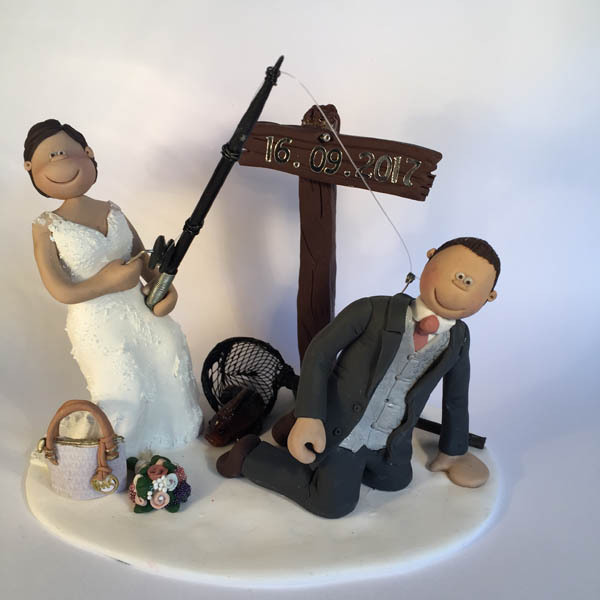 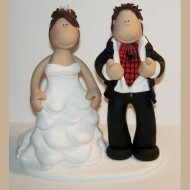 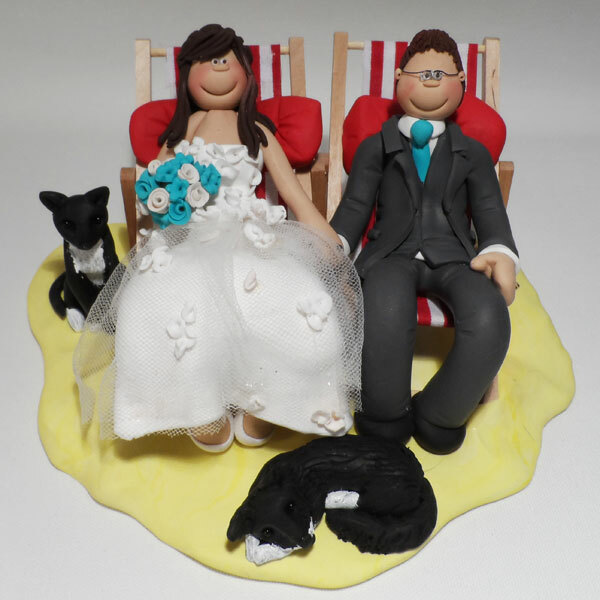 A cake topper featuring the bride in the bath and the groom hoovering! 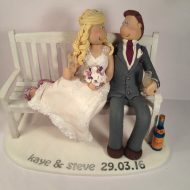 A bride and groom enjoying a cocktail and a pint of lager. This bride was quite a catch for the groom – literally! 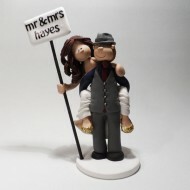 A groom giving his fiancee a piggy back! A bride and groom showing off their ‘Superman’ pose! 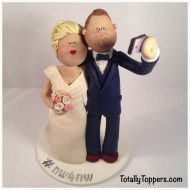 A groom working on his laptop with multiple distractions! 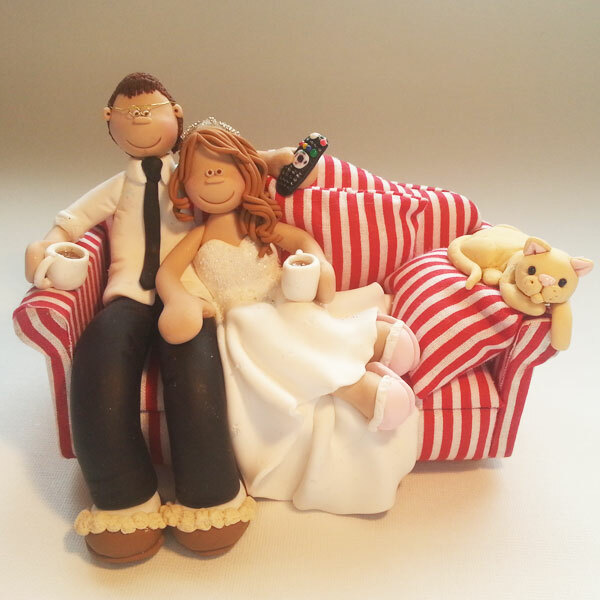 A couple relaxing on the sofa watching TV with a brew! 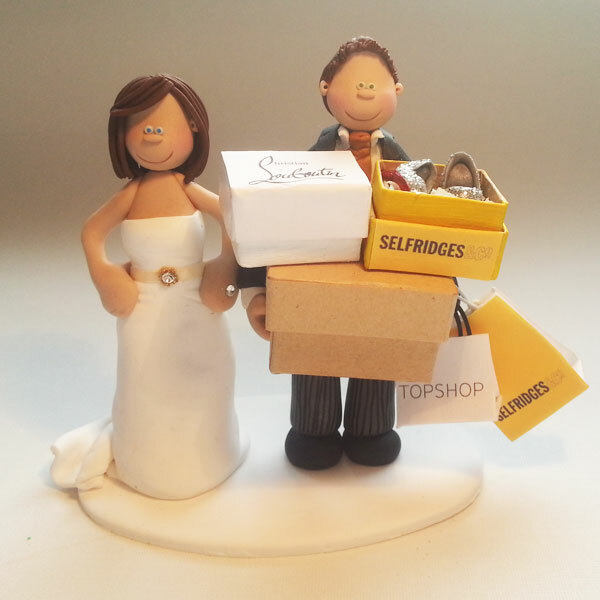 A shopping mad bride with her helpful fiancee! 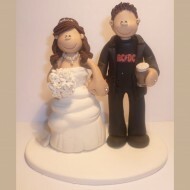 The groom in this topper was an ACDC and a Guinness fan! A bagpipe playing Scotsman and his beautiful bride! Only one of a few of our toppers featuring a beard! 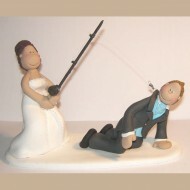 There was no way this groom was being let off the hook! Check out the sparkly waistcoat on the groom in this topper! A groom wearing his trainers to the wedding! 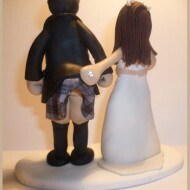 A cheeky bride with her hand on her groom’s bum! 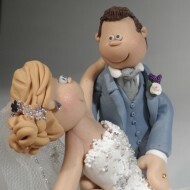 A rear pose of the bride’s hand on the groom’s rear! 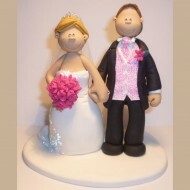 Even the groom is wearing pink in this wedding cake topper! An unusual pose for our toppers with the groom on the left! 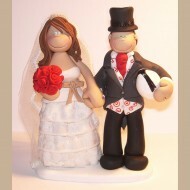 A groom in his traditional top hat and tails….with a rugby ball! 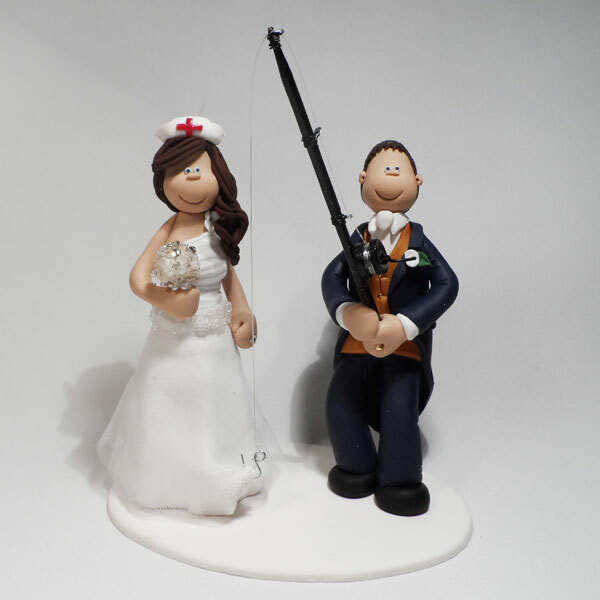 As with most women, this bride’s hobby was shopping! 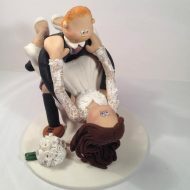 The real Spiderman? Not quite but this groom thinks so! 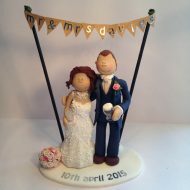 This bride needed a box to reach up to her groom! 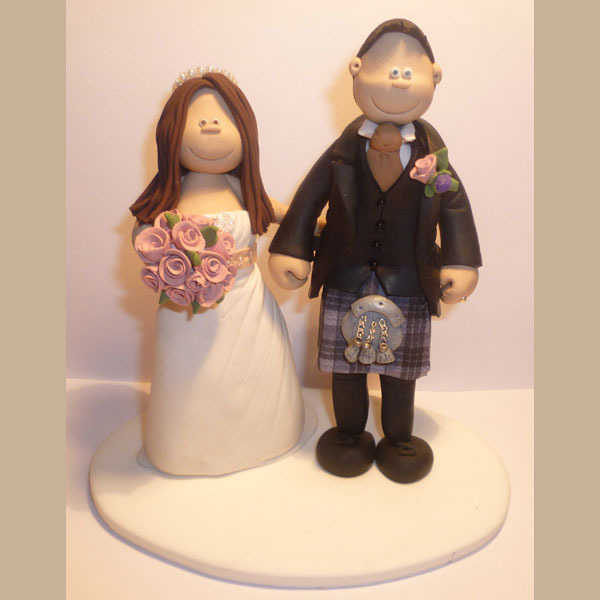 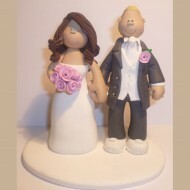 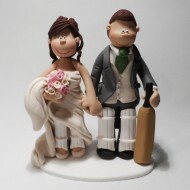 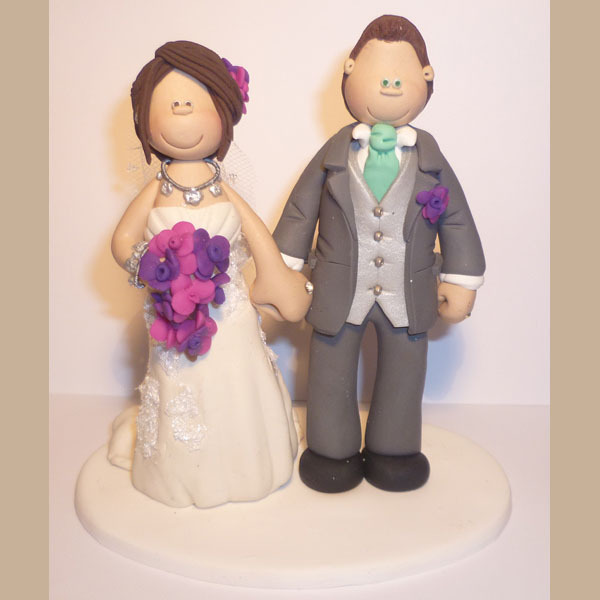 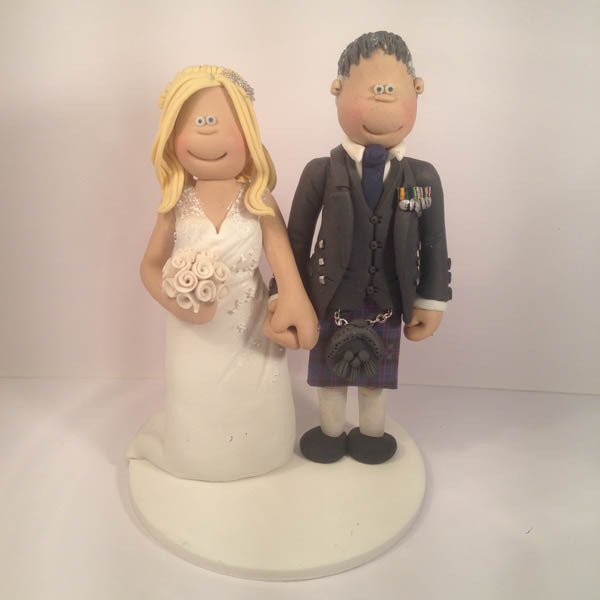 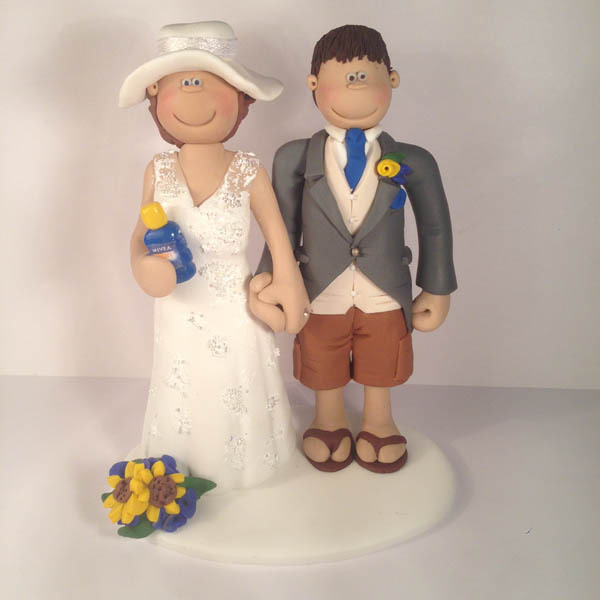 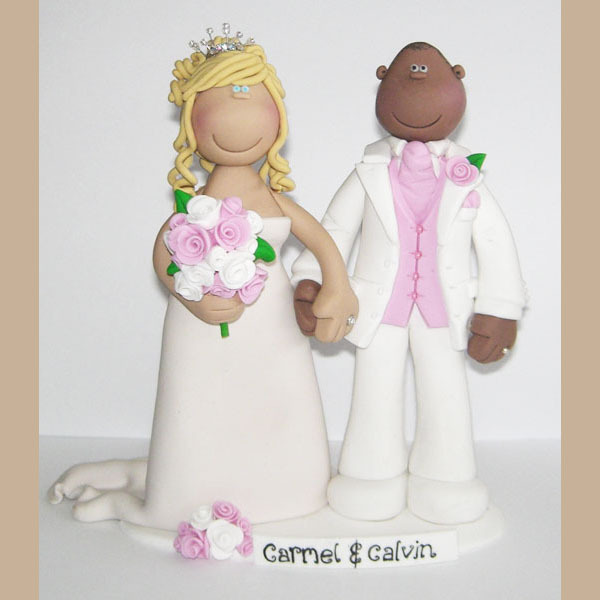 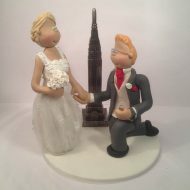 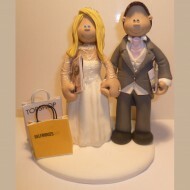 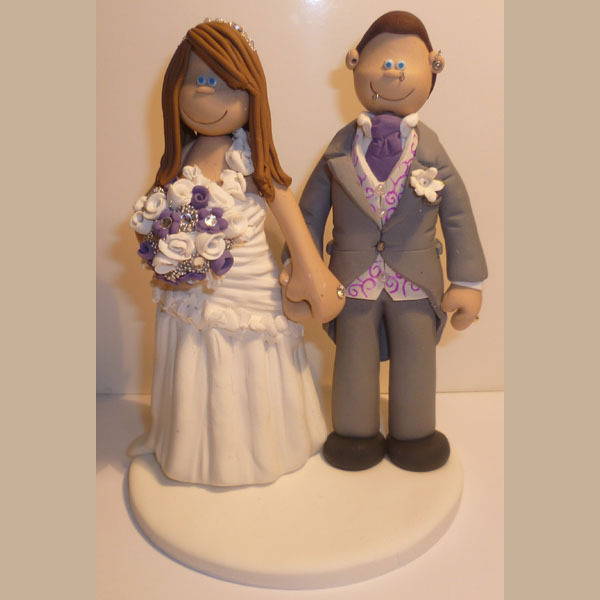 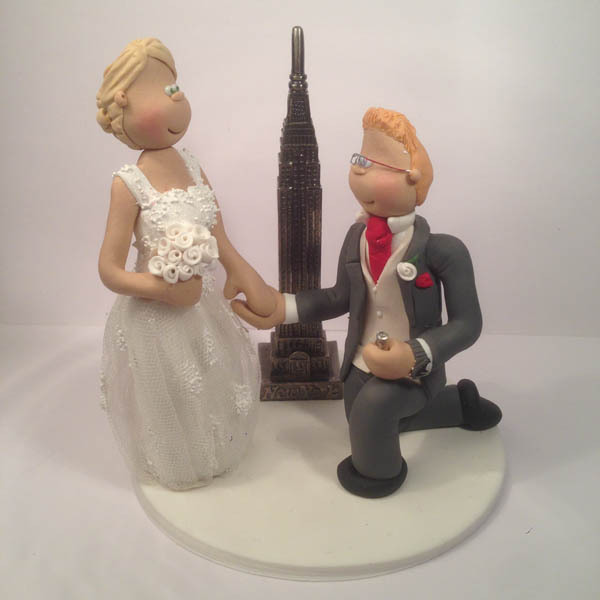 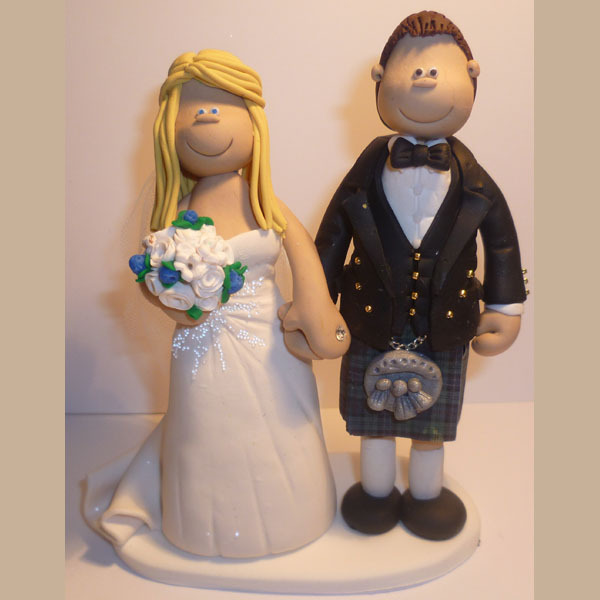 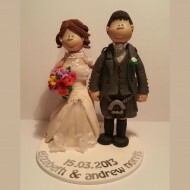 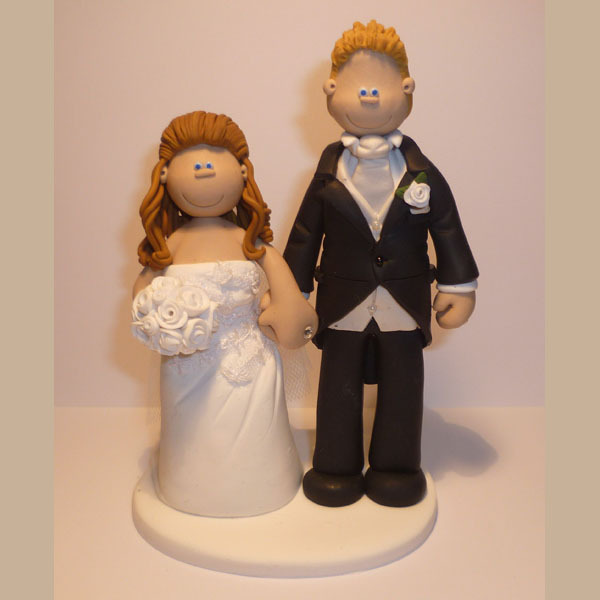 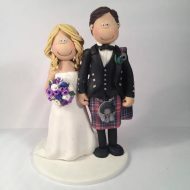 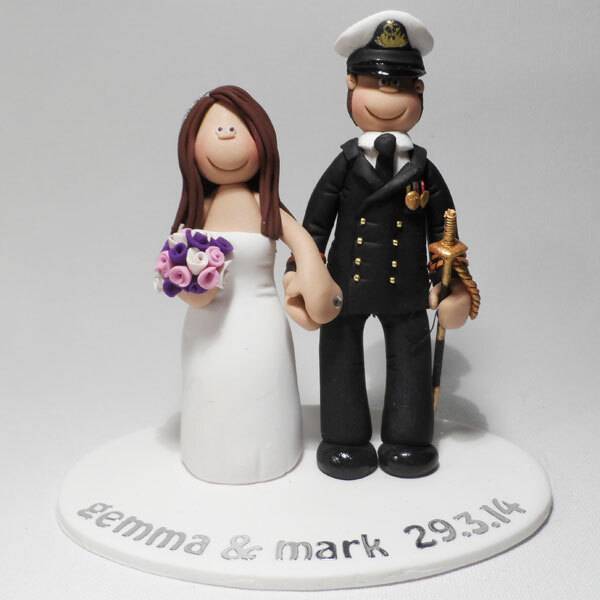 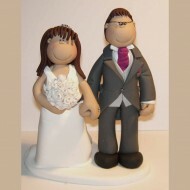 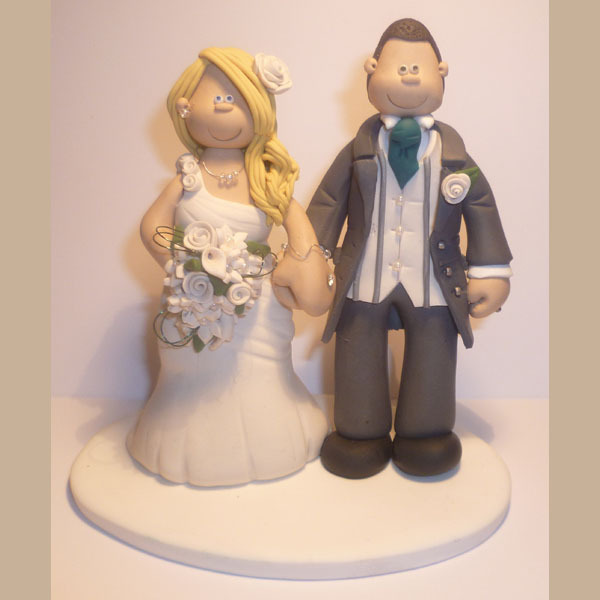 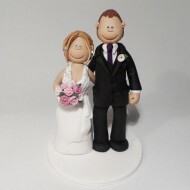 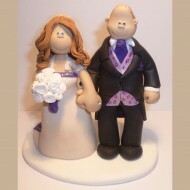 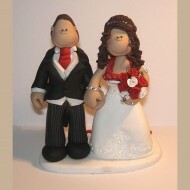 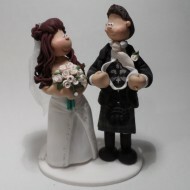 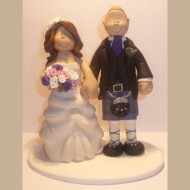 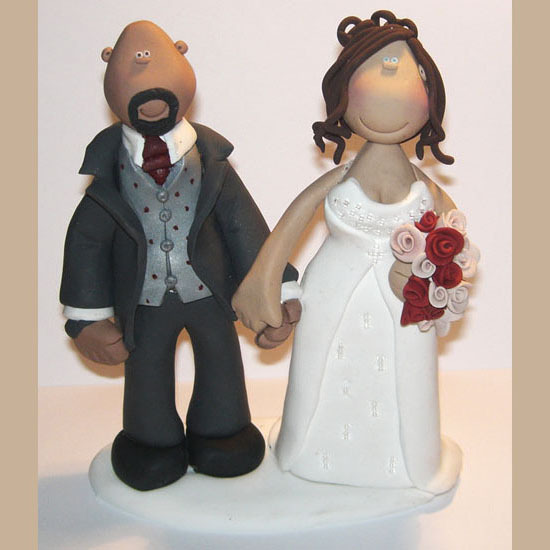 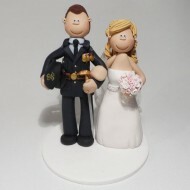 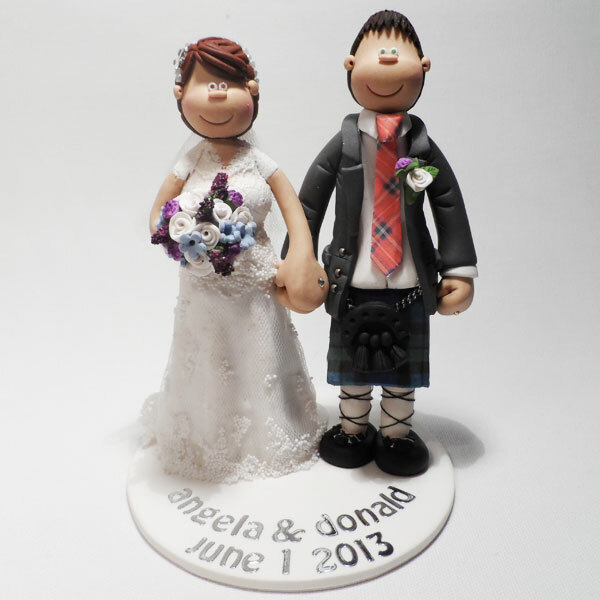 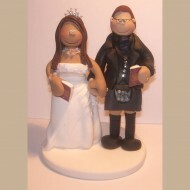 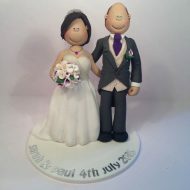 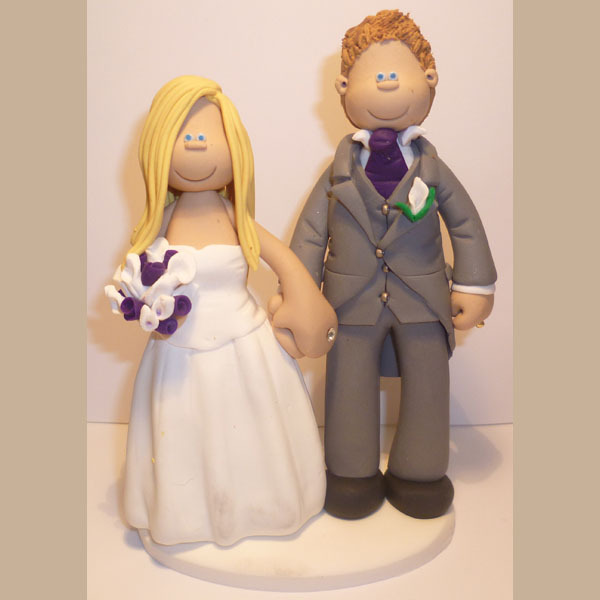 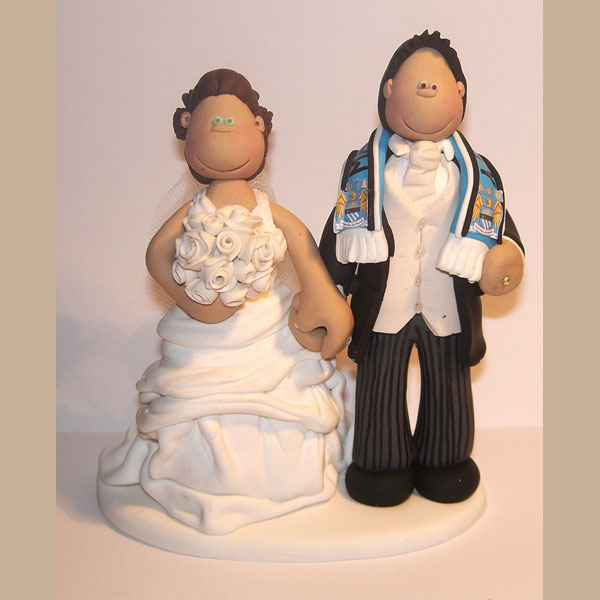 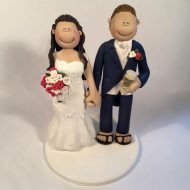 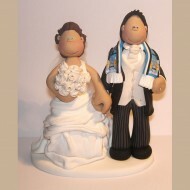 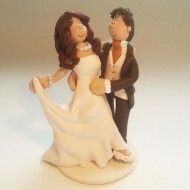 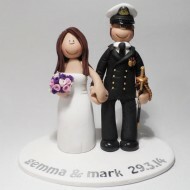 Another bride and groom topper with quite a height difference! 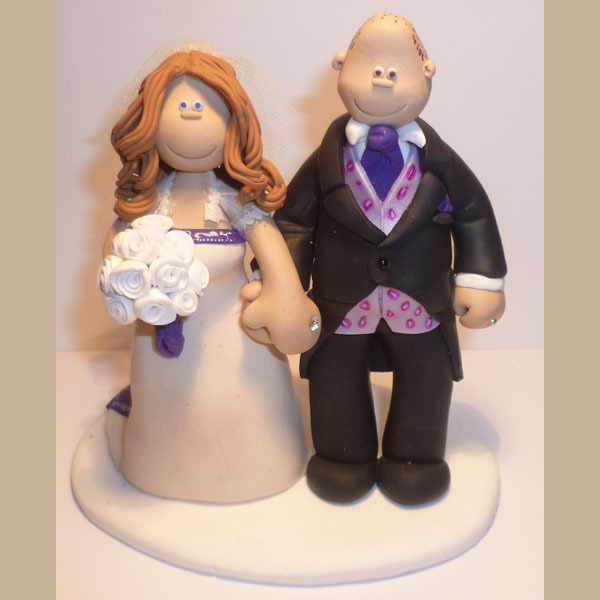 Cadbury’s purple was the theme of this couple’s wedding! 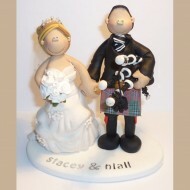 A topper made for Coronation Street’s Steve & Tracy! This wedding cake topper is all about the daffodils! 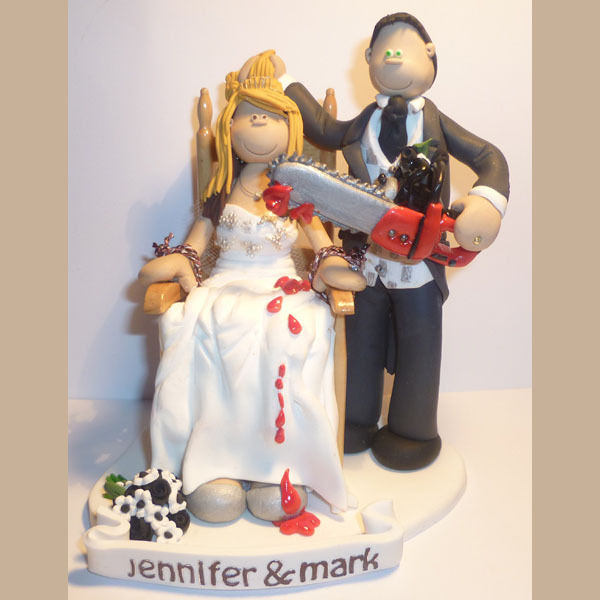 Our most gruesome cake topper with a halloween theme! 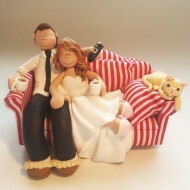 A bride into her baking and a groom always on his iPhone! The ‘rear’ of one our of our most popular kilt toppers! 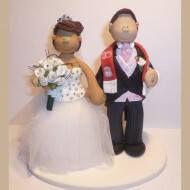 Another groom trying to get his beloved LFC in the wedding! 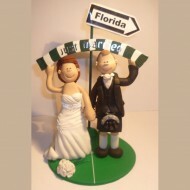 A subtle way of getting his beloved Man City to the wedding! 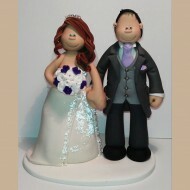 A bride and groom of equally tall stature! 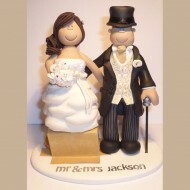 Pinstripe trousers are the stand out feature of this topper! 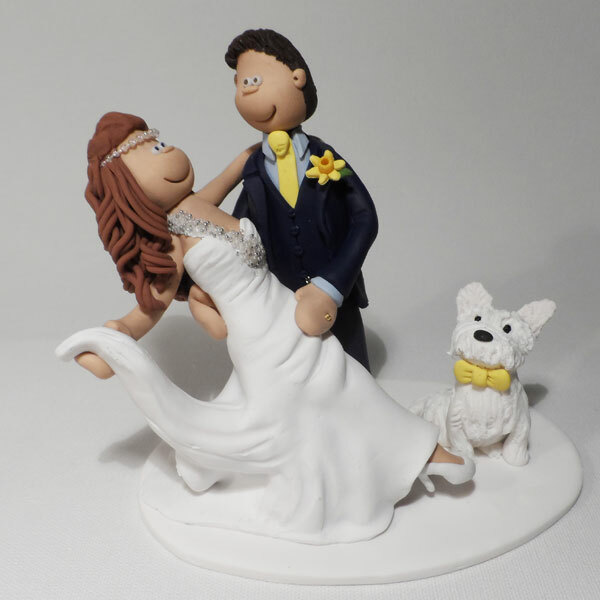 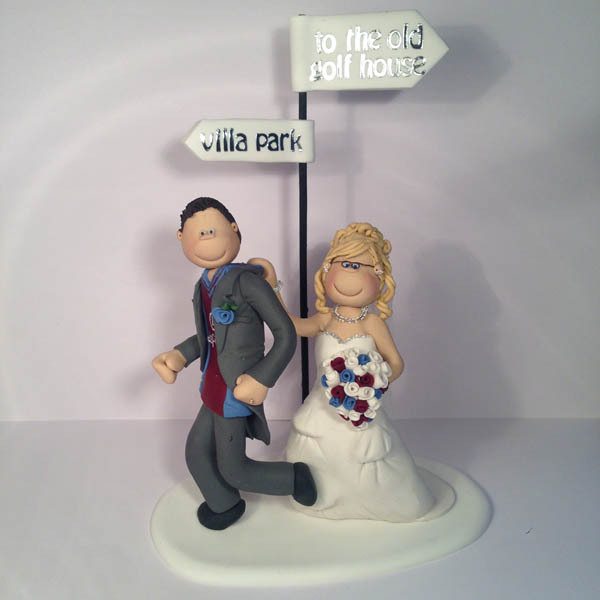 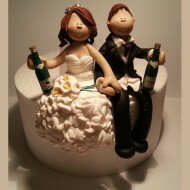 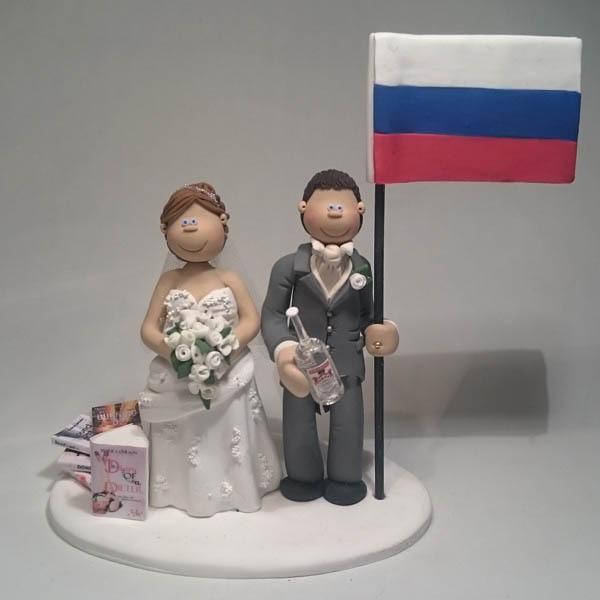 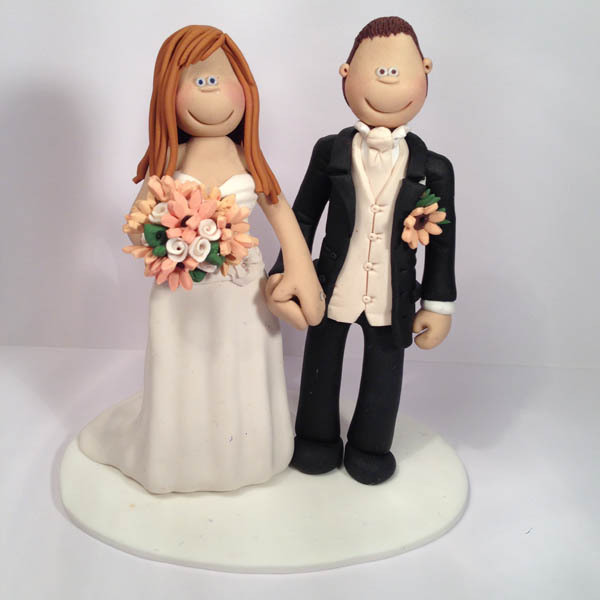 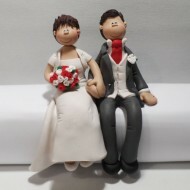 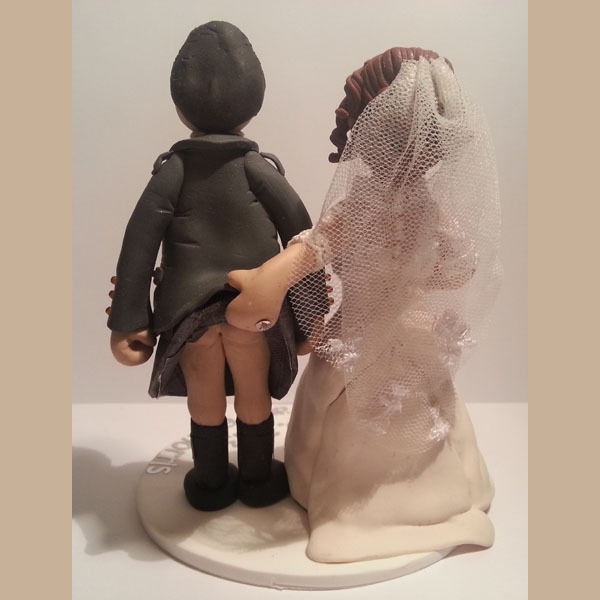 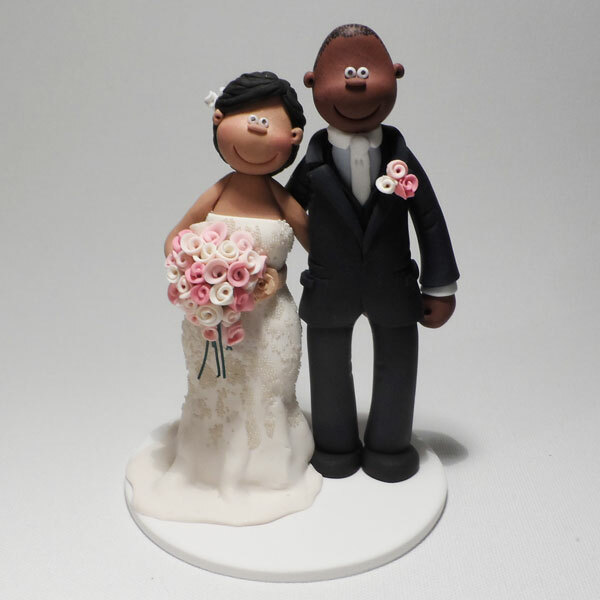 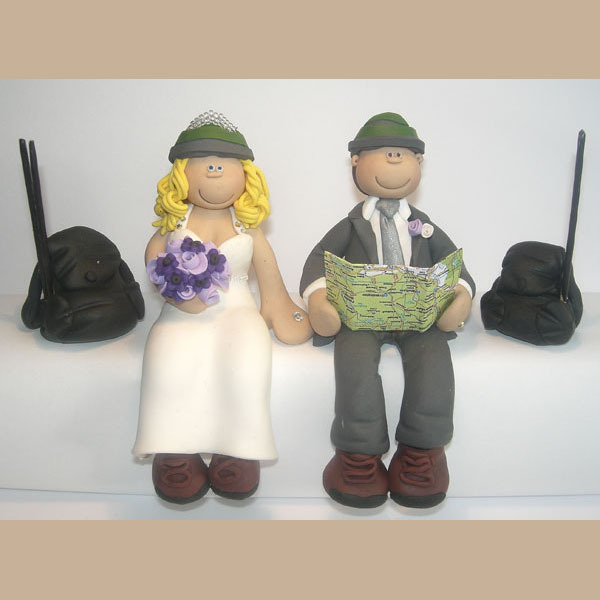 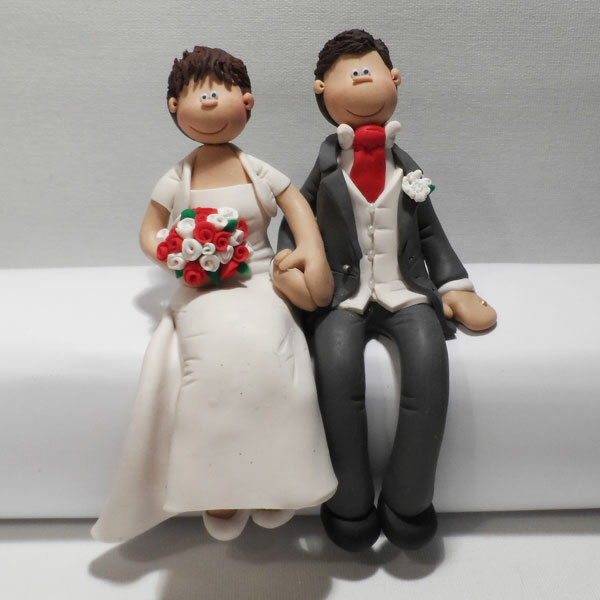 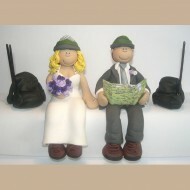 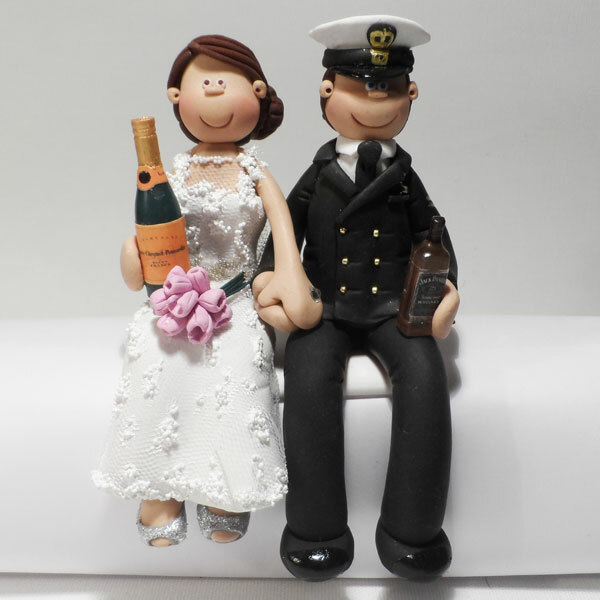 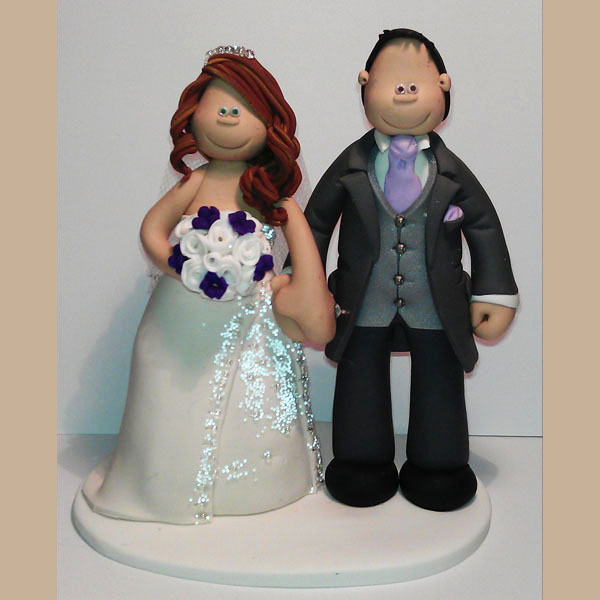 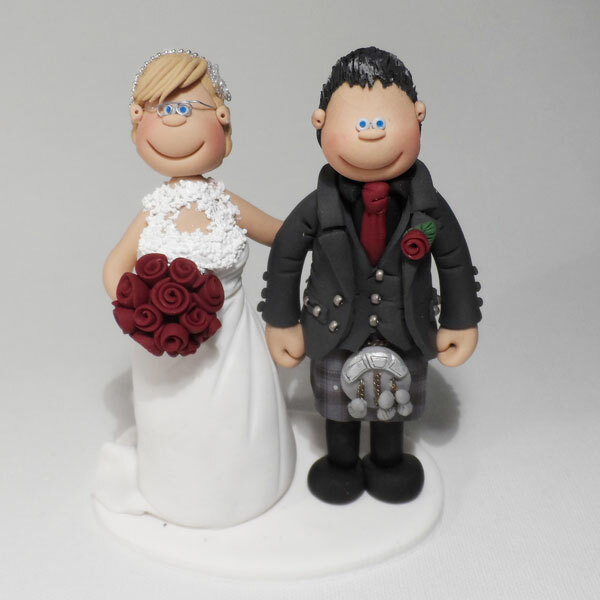 A cheeky bride and groom wedding cake topper! 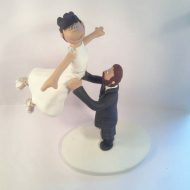 This cake topper features quite a height difference! 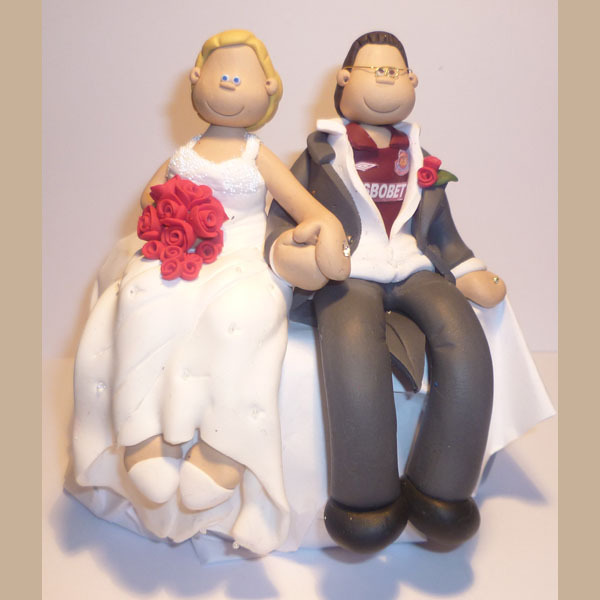 A groom sneaking his West Ham shirt into the wedding! 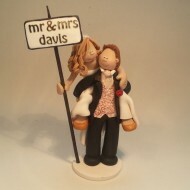 A courageous groom wearing a white suit in this topper! A tug of war over the groom between the bride and their dog!